There was nothing entertaining about the program at the State Theatre on Tuesday morning. But it just might save lives. Hundreds of people — business owners, downtown workers, city employees, a survivor of the October 2017 massacre at the Route 91 music festival in Las Vegas — turned out to get expert advice on the “pre-incident indicators” exhibited by past mass shooters, as well as what to do when caught in the midst of a shooting. The free Active Shooter Symposium was presented by the Modesto Chamber of Commerce and Rank Investigation & Protection. 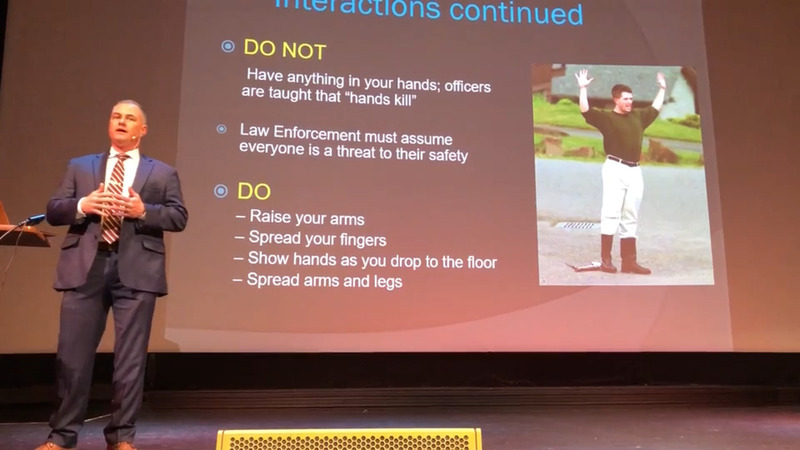 It began with psychologist Philip Trompetter, who specializes in police and forensic work, telling the audience the importance of being in a “yellow zone” state of mind when in public. That means being aware and alert of your surroundings, but also remaining calm and relaxed. He later handed the mike to James Yandell, a Ceres police lieutenant and SWAT commander and Rank employee who talked about what to do if caught in the midst of a shooting. There were 30 so-called active shootings — defined as an incident still in progress when police arrive — in the U.S. in 2017, Trompetter said. That’s the largest ever recorded by the FBI in a one-year period. The symposium was “not intended to scare anyone,” he said from the stage, because it’s highly unlikely for anyone to be caught up in a mass shooting. But when they do happen, they’re catastrophic, so it’s worth talking about how they might be averted, he said. Because mass shootings almost never are spur-of-the-moment events, but rather planned for days, weeks, months, even longer, there is time for the observant to see the clues “leaked” by would-be shooters, Trompetter said. Shooters under 18 tend to “leak” more to teachers and classmates than to their families, he said, while adults do so more to their romantic partners. The clues they leave take many forms: tweets, text messages, doodles and drawings, expressed interest in previous mass shootings, innuendos like “I’m going hunting,” even tattoos. Among school shooters, Trompetter said, some have attempted to recruit a partner in crime, or warned friends to stay home from school a particular day. Yandell’s portion of the program focused on the “run, hide, fight” options faced by those who encounter an active-shooter situation. He, too, spoke of the importance of getting into the yellow zone mentality — being alert and thinking clearly and calmly to survive. Running is the “first and best option” if it’s available, he said. That’s what Turlock resident Christie Marriott was hoping to hear. Because running and jumping into a car with other fleeing concertgoers — strangers she now considers part of her family — is how she survived the shooting at the Las Vegas festival that left 58 people dead and hundreds injured. Marriott signed up for the symposium as soon as she heard about it, in part because she wanted affirmation she did the right thing that night. She did, Yandell said. She got out of there, and she helped some others without letting it slow her down and keep her in harm’s way. Hear Marriott’s account in a video with this story at modbee.com. If fleeing a shooting isn’t possible, hide, Yandell said. A windowless room with a lockable door is best. If the door can’t be locked, barricade it. Turn off any lights and keep quiet. If there are windows, stay out of view. As a last resort, when actually confronted by a shooter, fight, Yandell said. In a rare moment that drew some laughter from the audience, he reminded women that high-heeled shoes can be wielded as weapons. So can a heavy purse swung like a medieval mace, he said. Even a simple pen can badly hurt a shooter if stabbed into the soft tissue of the throat. Have a belt with a big, cowboy-style buckle? Wrap it around your wrist with that hunk of metal in front, and punch away. Fire extinguisher in the room? Empty it into the attacker’s face, then beat him with the canister. And once you start hitting the gunman, don’t let up until he’s not getting up, Yandell said. The symposium was concluded by a team of Doctors Medical Center nurses that offers free Stop the Bleed training — simple ways to stanch uncontrolled bleeding — each month at the DMC Conference Center. The next class is Feb. 28. Learn more by visiting cms.bleedingcontrol.org/class/search or calling 209-573-6151.